A friend of mine recently posted in a Facebook group that she needed Christmas gift ideas for her hard-to-shop-for husband. My first suggestion was a gift of the month club item. One of my new favourites is Good Luck Socks. Let’s face it, everybody wears socks! Even people like me who wait until it is the dead of winter and just too cold to keep shirking the socks eventually need to wear them. 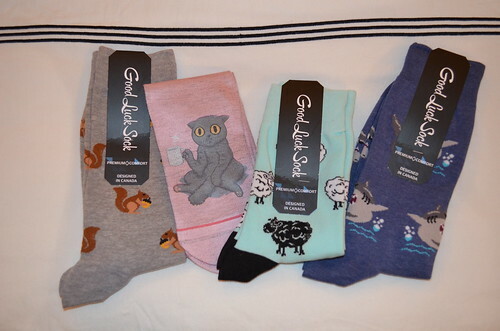 What I love about Good Luck Socks is that they are a Canadian company that offers socks for both men and women, and offer both individual gifts and monthly subscriptions. You can choose from a 6 month, 12 month or Baker’s Dozen option to suit your budget and the recipient’s needs. Plus they have two size options for both men and women so you can be sure that the feet in mind are covered appropriately. There is nothing worse than socks that don’t fit well. True story. Funky socks are completely on trend these days. Everybody loves to express a little bit of creativity and personality with their accessories and socks are no different. Good Luck Socks have an amazing selection of traditional, funky and downright hilarious socks for pretty much anybody in your life. We tried out both the men’s and women’s socks and my humongous footed almost 8-year-old was able to test run the women’s option as well. He was thrilled to say the least! My only issue with the socks is that while they are decent quality, they do suggest washing them in cold water and line drying them to reduce damage (pilling) and extend the life of the socks. I’m a mom. I have four people in this house that have laundry. I simply do not have time to weed out socks to wash separately and line dry. That being said, they have held up just fine after being washed and tumble dried so this is most certainly not a deal breaker for me at all. Perhaps just something to keep in mind. Socks run around $13.00 CDN and shipping is free over $50. The monthly subscriptions are between $72.00 and $138.00 CDN and shipping is included each month in that price. I love the idea of somebody receiving a gift once a month, but I only have to purchase something once. If you are looking for a gift that is a little different this holiday season or for that hard-to-shop-for friend or family member, Good Luck Socks may be the perfect option for you. Disclosure: This is a partnered post with Good Luck Socks. A product sample has been received for this review and all opinions and views on this post are 100% my own. who doesn’t love a great pair of socks!? I love this idea! I love socks and its my way of rebelling against my “world”… LOL! Fantastic socks, love the designs. I also love that they are a Canadian company, that’s always good to read. My husband is a sock a holic and I don’t know weather to show him this site or keep my lips sealed. I love the idea of a sock subscription! And it’s great that it’s a Canadian company too. This is so awesome, everyone needs socks and they have some pretty fun designs as well!! Those are such fun socks! Great idea for gifts! I know this may sound strange, but I love getting cool and unique socks/ I feel extra special when my socks are adorable.